A sweet lovely dessert with marble like appearance achieved by preparing light chocolate, dark chocolate ,strawberry syrup separately and then blending together evenly in a pudding tray. We can use different colors instead of chocolates or can use colored syrups . But chocolates and home made syrup is tastier and healthier when compared to others. 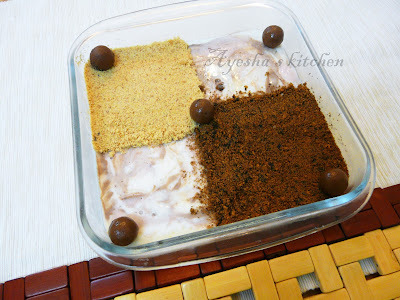 Here is my recipe of how to make simple marble pudding using chocolates. It gives a nice marbling effect as i used three different colored layers. Give it a try and enjoy.. will love this for sure as it is a blending of three different tastes. Melt the milk chocolate and diary milk chocolate in a separate bowl by double boiling method ( do not melt chocolate directly over the flame. so always keep the bowl with chocolate over a boiler or vessel with boiling water). Keep it aside. Make strawberry syrup by boiling together finely chopped strawberry (6 nos) with 4 tbsp sugar and 3 tbsp water. Stir continuously. When done, blend to a fine paste once cooled. Keep these three ingredients ready in three separate bowls. Boil milk in a heavy bottomed pan and when boiled add the condensed milk and stir well. Make the flame very low, stirring occasionally. Now prepare china grass in a separate vessel. Soak the china grass in cold water for few minutes and then cook over a low flame until it dissolves to a clear liquid. Mix it with the milk and milkmaid mixture using a strainer and stir well. When done off the flame. Now pour it equally in three separate bowls. Immediately mix one bowl of milk mixture with milk chocolate, the other with dark chocolate, finally with strawberry syrup. Now the mixture is of minimum thickness. Now take a pudding tray, pour one ladle of milk chocolate mixture in the center, then a ladle of dark chocolate in the center of milk chocolate and then strawberry syrup in the center of dark chocolate. Continue the process. You must be very fast, as the china grass will hardens the mixture. When done take a knife and make some zig zag lines gently on the top . 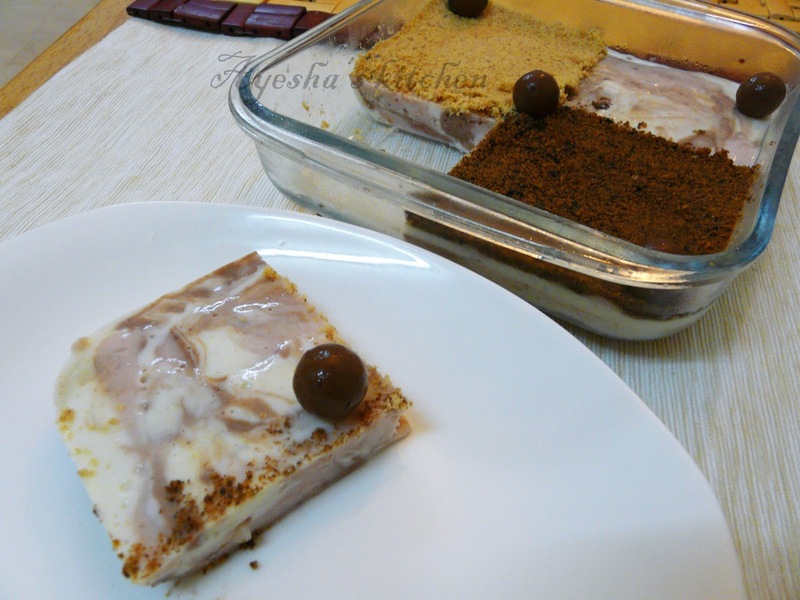 Finally decorate with powdered biscuits or nuts.